Hatfield's strategic location, straddling the A1M motorway and its proximity to London, have made it an attractive location for companies involved in the business of distribution (or running their own distribution network). Several major players in the mail and food markets have set up base in Hatfield following the redevelopment of the airfield – and they are not the only ones. Booker – the group is the UK's largest Cash and Carry operators. Their operations at the Hatfield Business Park is one of three UK regional distribution centres (with a national distribution centre in Wellingborough). CityLink – bought unit 7510 Frobisher Way (Hatfield Business Park) in January 2011, and after a refit commenced operations a few months later. Founded in 1969, CityLink is owned by Rentokil Initial plc (a FTSE100 company). Computacenter – the largest UK-owned IT company is based on a 20-acre site on the Hatfield Business Park. This includes its head office and warehouse operations. DHL – now part of Deutsche Post (the German Post Office) they are one of the largest mail and logistics private operators in the UK, and one of the biggest in the world. They had two sites on the Hatfield Business Park till they sold of their domestic parcels business – including the larger DHL Express (UK) Ltd depot at Hatfield – to Home Delivery Network Ltd was announced in January 2010). Ocado – started in January 2000, and initially tied in with the John Lewis supermarket chain, Waitrose. 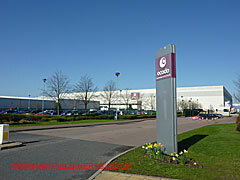 Their 23-acre site with its 1.2m sq ft Customer Fulfilment Centre (pictured above) dominates the Hatfield Business Park. It is the world's largest direct to customer (internet shopping) food distribution centre. Royal Mail – the world's oldest mail operator. Their Northern Home Counties Distribution Centre is based on the Hatfield Business Park (formerly Manor Road / BAe Dynamics site), close to the DHL main site in Hatfield. Tesco – One of the UK's biggest and frequently No.1 supermarket chains. Strictly speaking the Tesco depot (one of 24 nationwide) in Travellers Lane is on the side of the road that comes under Welham Green. However, road access to and from the site is only from Hatfield. Yodel Transport Ltd / Home Delivery Network Ltd – a standalone company set up in 2010 by Home Delivery Network Ltd (HDN), following their purchase of DHL's domestic parcel business through a subsidiary company, Parcelpoint Ltd. HDN is part of Telegraph Media Group, who also own Shop Direct (which used to be Littlewoods). Yodel was launched in May 2011. They operate in Hatfield from the former DHL Express depot on Frobisher Way.